Capitalizing on views of their landscaped backyards from the kitchen and breakfast nook is a common goal of many homeowners and a challenge for kitchen designers. Many product options are available today that allow kitchen layouts to go well beyond including just the standard window above the sink. Renaissance Conservatories, Leola, Pa-based manufacturer of wood frame conservatories and solariums, also offers garden windows. 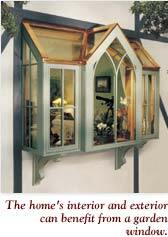 Each garden window is built to order, so it can be custom sized to fit any window opening. Standard features include adjustable wood or glass plant shelves, operating sash with screens, high performance Low E insulating glass, decorative corbel supports, a removable copper drip tray for easy clean-up, and framing in mahogany, redwood, or cedar. Two window styles are available-a top-hinged awning style, which opens out from the bottom and a side-hinged casement window style. *Increase the window projection from 16" to 24" for the client who craves well-lit space for an indoor garden. *Add plant boxes with interchangeable flower trays and seed screens. *Create a focal point in the kitchen through the decorative grid and arch frames in a complementary or contrasting wood species. *Add visual interest to the exterior of the home via capping frame metals such as copper, lead-coated copper or custom powder-coated aluminum. 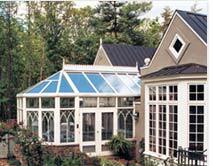 *Tie the kitchen in with an adjacent solarium or conservatory that serves as the breakfast nook or dining area. Conservatories are particularly well-suited for creating period looks and extending the styling of Victorian, Arts & Crafts, and other traditionally designed homes. 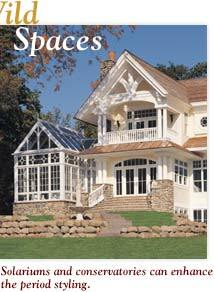 For out-of-the-box examples and ideas on windows and conservatories, visit www.renaissance-online.com.